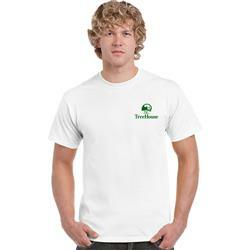 The Gildan Ultra Cotton White t-shirt with a 1-color imprint included. One of the best selling t-shirts in the industry!Classic fit t-shirt made of 100% cotton* 6 oz. Preshrunk Jersey knit fabric. Features seamless double needle 7/8 collar. Taped neck and shoulders. Double needle sleeve and bottom hems. Washing Instructions: Machine wash warm, inside out. A classic best selling screen printed t-shirt at a great price! Pricing shown is for S-XL. Production Times Available: Standard 5 to 7 business days with a paper proof. Inquire for Rush. Dimensions: Size Dependent but 12"H x 12"W for full front or back. Typical Imprint Area(s): 12"H x 12"W for full front or back.